The most religiously devout of the Founding Fathers was Reverend John Cotton (1585-1652). He was an eminent theologian in the early days of Massachusetts. Cotton was born in Derby (pronounced "Darby"), England, and was later parish priest in old Boston at the famous St. Botolph Church. Cotton emigrated to Massachusetts in 1633, and with John Wilson they established the first church in Boston. Cotton was called the Teacher, and Wilson was called the Pastor, as such was the distinction of that day. 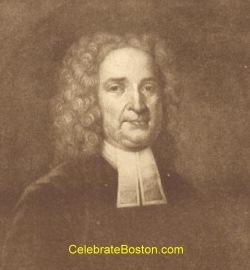 John Cotton remained Teacher at the first Boston church until his death in 1652. It is believed that establishment of the Boston Latin School, America's first public school, was largely due to the work by John Cotton. His accomplishments as a scholar and writer were high, and his influence very great, in the early church and in government. He was fond of being consulted, and in giving advice, but was sometimes accused of having a dictatorial spirit. His opinions often settled disputes, in both church and political matters. Before leaving England, Cotton was well known as an eloquent speaker, and as a teacher, and this served to give him much influence in Massachusetts and New England. Reverend Cotton was a man of ardent piety, but he would at times indulge himself in the fanatical, whether for the sake of popularity, or to promote his views about religion. He was so great an advocate for what he called Doctrines of Grace, that he favored the most fanatical of the Antinomians, and they drew conclusions from his opinions to support their assertions. Cotton also assisted in the forming of civil laws and ordinances in the colony, but some of his views were not approved. His beliefs were similar to those of Thomas Dudley—very severe against religious dissenters—and he stressed his own system of faith. Cotton assumed that he had found the true faith, and that it was his duty to require others to embrace it. 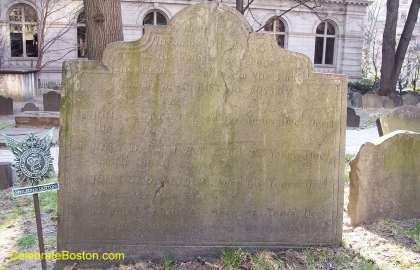 John Cotton is buried in a collective tomb with other devout clergymen at King's Chapel Burying Ground. John Davenport rests in this same tomb. The marker is on the left side of the grounds, just to the left of the Winthrop Tomb. The marker's engraving faces the street, and is not visible from the walkway.